Thursday afternoon, some friends from the Archaeology in Annapolis project - Jenn, Amelia and Matt - joined me at the Pacific Avenue Site for excavations in a trench between the main house and an old foundation wall, which we are now calling Feature 1. For those unfamiliar with the term, a feature is anything made or modified by humans (an artifact) that is too large or complex to remove in one piece. So while a brick is an artifact, a brick wall is a feature, because you could never take it to the lab and analyze it as a whole. 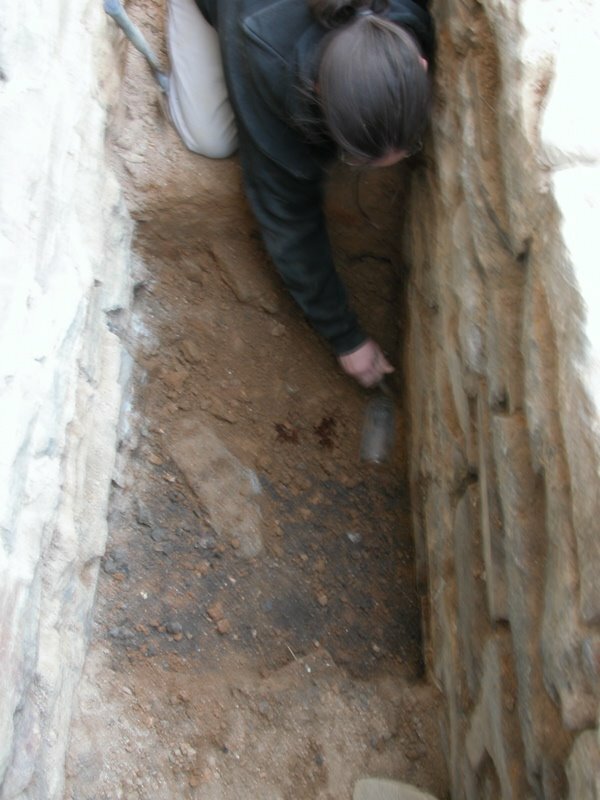 Other examples of features might include privy pits that have been filled with artifacts and soil or stains left in the dirt from old plantings or postholes. Anyway, Feature 1, a dry-stacked stone wall lies parallel to a several-foot deep, 1.5-foot wide trench that has been filled with soil. Because new house construction will cover up that trench, we decided to dig an excavation unit within it in order to try to discover the function of the trench and to date the soils that lay within it. 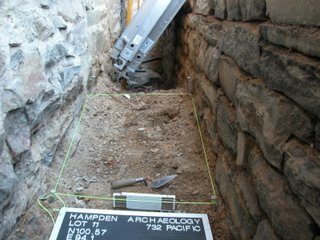 The hope was that we might find a builder's trench - another kind of feature - which might help us to date Feature 1 or the house. 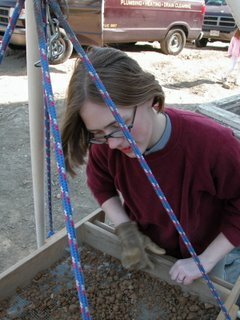 Jenn began excavating through a thick,compact layer of clay and silty-clay fill that was roughly 9-inches deep. Within this layer, and especially at its base, we found a variety of artifacts dating from the early 1800's through the 1930's. This included ceramics, machine-cut and hand-wrought nails, along with window and bottle glass like this Old Grandad Bottle recovered from the base of the layer. Text on the bottle dates it between the 1930's and the 1960's. The upper layer of the trench was filled in sometime after 1930, likely all at once with soils from nearby. Beneath the clay fill lay a stratum of coal ash probably tossed into the trench from the nearby basement. While Amelia and I screened soils and kept careful records of what we were doing and finding, Matt, a skilled artist, began a measured drawing of Feature 1. He carefully sketched each stone in place, fixing the feature in relationship to other parts of the site, including our excavation unit. 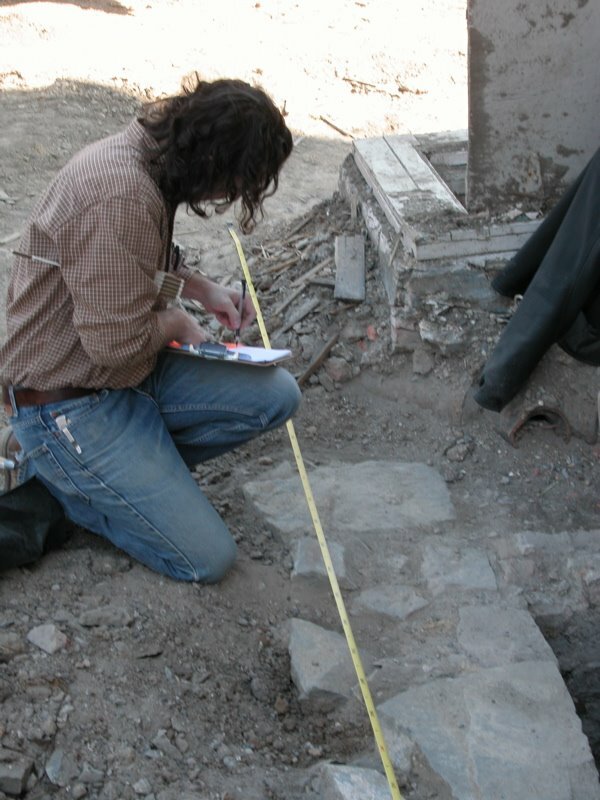 So far, we haven’t been able to determine the age or function of the trench. However, this information will likely become clear as we continue to excavate. I plan to be out in the field next for a half-day on Friday, and anyone who wishes is welcome to join me. Email me for more information. we have been rehabbing our house in brick hill. Thought I would let you know what we came across. It wasn't much and we found it all inside the home.